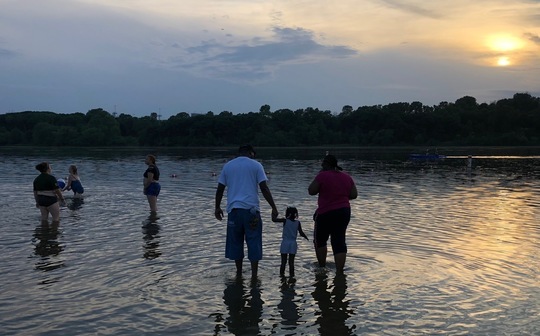 The Great River Passage is celebrating the summer with richly partnered programs and events welcoming all people to deepen their relationships with each other and the wilderness in Saint Paul. Last weekend, alongside our partners, we hosted two fully-booked events, the Goat Meet and Greet and Family Camping at the River. Over 200 people braved the rain to meet the goats who have been grazing the river bluffs in Saint Paul since 2017. Jake Langeslag, owner of Goat Dispatch led an energetic, informative, and wide ranging talk about the ecology of goat grazing. In addition to the herd of 44 goats, he had the herding dog on hand for demonstrations. 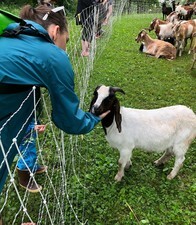 Attendees were able to feed the goats, ask all kinds of questions, and get up close with Sugar, one of the baby goats born at Crosby Park earlier this Spring. We plan to host another Goat Meet and Greet this fall. Stay tuned. Saint Paul families set up tents on Saturday for an overnight camping trip at Fort Snelling State Park. This program is in partnership with Wilderness Inquiry and geared towards Saint Paul families who are new to camping. Wilderness Inquiry provides all the equipment, meals, and outdoor skills. We had all kinds of groupings from intergenerational family groups to aunties with nephews and nieces. 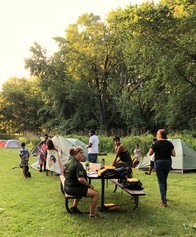 Families enjoyed nature right here in the city - swimming, canoeing, hiking, observing fields of fireflies, and community making.